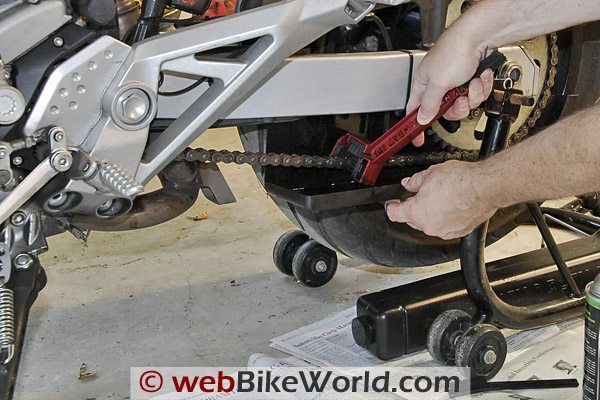 The Chain Drain motorcycle chain cleaning system fits under the chain and rear sprocket to help prevent overspray from chain cleaning fluid and chain lube. The dripping chain cleaning fluid collects in a sealed canister that serves as the base. It’s not that I haven’t been trying. Thinking of something like this, that is. 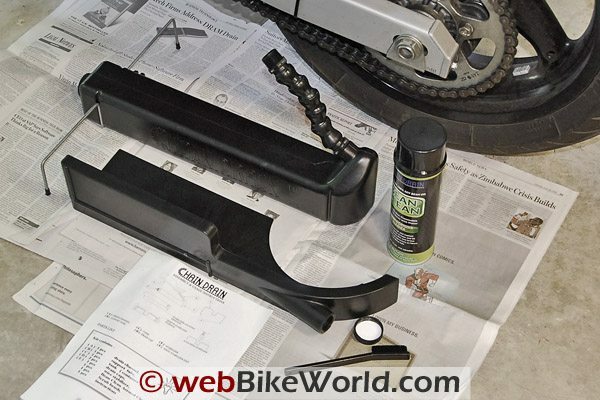 I’ve tried using newspaper, cardboard, sheets of acrylic — even cast-off pieces of linoleum from an old kitchen floor — all in desperate attempts to keep the rear wheel reasonably clean while I slop kerosene, WD-40 and the like all over the place. In my spare time, while I’m daydreaming (which, according to my colleagues, is way too often) and I’m trying to keep my mind off of…well, you know…I’ve been investing some of the little gray cells in thinking about how I might invent some type of chain cleaning system that would actually work. The goal would be to contain the spray so it doesn’t get all over the tire and the floor, while collecting the jism that slops all over, so I could dispose of it in some sort of semi-environmental fashion, all the while keeping the filthy greasy stuff from squirting all over my glorious bod. Now that I’m thinking this through, I’m wondering why I’m still riding bikes with chains? And by the way, what ever happened to the promise of belt drive? If Buell can do it, why not everyone else? So along comes the Chain Drain — these are the guys who make the nifty Bean Clean soybean based degreaser (review). In fact, they were originally going to send us a Chain Drain, but it wasn’t quite ready. But now it is. The Chain Drain chain cleaning kit is available with or without a can of Bean Clean spray. Without the spray, the system costs $39.95 as of this writing. It’s worth it to avoid the mess, I’ll tell you. The kit consists of a square base made from some type of molded polystyrene that acts as a container to hold the icky fluids as they run off the chain. The base is about 19″ long by 3″ wide by 2-5/8″ tall (or 48 cm by 7.5 cm by 6.5 cm for you metric types). It has a screw cap on one end to keep the stuff inside, and the other end has a screw-on flexible plastic spout thingy. The spout screws in to the bottom of the spray guard, which is shaped to roughly fit under the bottom run of the chain and around the sprocket. Obviously, it would be impossible to design this to fit every make and model of bike, so we had to do some shifting around. The spout is about 150 mm (6″) long. It might be nicer if it was a bit longer, which would maybe allow the tray and base to be located back farther, but it works OK as is. But I discovered that it doesn’t really matter if the half-moon round shape that looks like it goes around the sprocket really is fitted right around the sprocket; the entire assembly can be shifted back and forth to pretty much fit any bike we tried it on. Chain Drain Parts and can of Bean Clean (review). Chain Drain placed between rear swingarm stand and rear wheel. Note backsplash under chain. The length of the swingarm will be different on each bike, and the height of the backsplash on the spray guard may interfere slightly as it’s stuffed up behind the chain. But everything is easily adjustable by moving the splash guard up and down and around by simply bending the flexi-spout. The entire thing measures about 20″ long total. The base has a couple of molded-in holders for the metal stabilizer, which is a bent piece of metal wire that snaps perpendicularly (is that a word?) on to either the front or the rear of the base to hold it steady. You can see it in the photo directly above, where it’s snapped in to the back of the base. But I don’t think it’s really all that necessary, as the base stays fairly stable by itself when the bike is raised up on a swingarm stand. 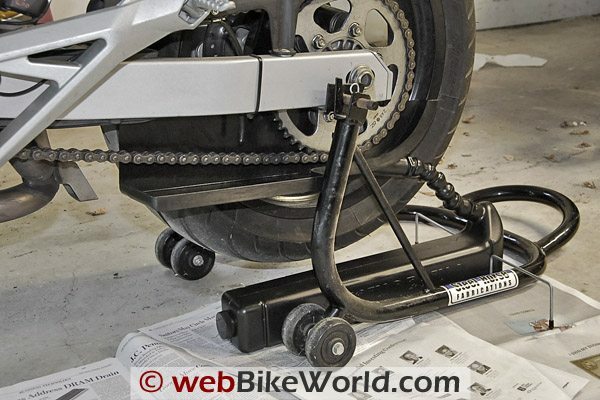 The only tricky part may be fitting the Chain Drain cleaning system between the rear swingarm stand and the wheel. At first, I stuffed everything in between and then snapped on the wire stabilizer, but realized that the system wasn’t going anywhere anyway, so now I don’t even bother with the wire. Other than that, it’s a piece of pie. Get everything lined up and go to town! Obviously, you still have to be careful with where you spray the cleaner, slop the kerosene or spritz the lube. But the backsplash does a good job at keeping everything off the wheel, and the overrun drips down into the tray, where it flows back and down the drain into the base for collection. You may have to futz a bit to make sure the backsplash is at a slight angle so gravity pulls the stuff down the hole, but that’s a no-brainer. Spraying Bean Clean and using the provided brush to clean the chain. They also send you a little plastic handled, nylon bristle brush to use for cleaning, but I use the tried-and-true Grunge Brush (review) because its three-sided bristles get on the opposite side of the chain plates. Oh, and one more thing: make sure you dispose of the waste carefully, adhering to all applicable regulations. You do NOT want this stuff floating around in the groundwater or river. Check with your local government to see what’s up and where the nearest recycling center is located. 40 bucks may sound steep, but do yourself a favor and cough up the dough and get yourself one of these things. It makes chain maintenance that much easier, if not fun. No, it’s not fun. Did I say that?? List Price (2008): $35.95 ($39.95 with a can of Bean Clean). From “R.F.” (August 2012): “It seems to be a nice tool but there is still a needed upgrade: The container where the oil goes down needs a removable easy to use filter, it could be some kind of rough plastic mesh, or a frame to place any piece of -at hand- cloth. Then, attached to the container a small hose with a hand pump (one of those small squeeze pumps) to pump oil from the container again back to the chain. 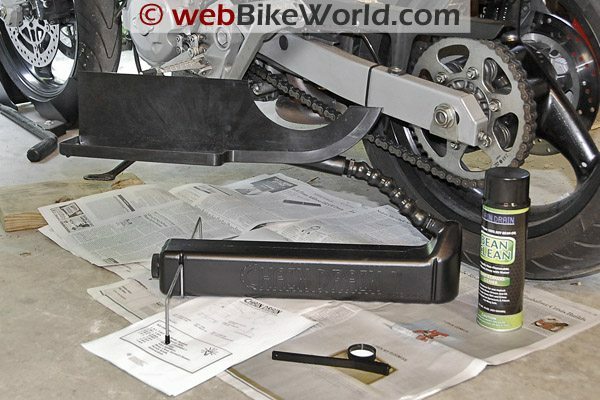 This way one can pour continuously oil over and over the chain and easily clean with a small brush. Add a couple of triangles to raise up the rear wheel so it can freely spin. Editor’s Reply: Actually, you can clean your chain in a lot less than 15 minutes and the Chain Drain is useful for collecting all the dripping residue, I still use it all the time and never found a need for a filter or anything in the collection canister. From “C.C.” (9/08): “I ran across this item when I was purchasing some of the Soy based cleaner you reviewed earlier and decided to pick it up as well. Well I haven’t used it to clean my chain yet, but I have found it is handy with oil changes. I wish the reservoir was a little larger, but it was just big enough to hold a single oil change in my bike. Editor’s Reply: Great idea! I wouldn’t think it would be too hard for Chain Drain to make a funnel-like attachment that screws into the flexible spout?